First Grade Mathematics. 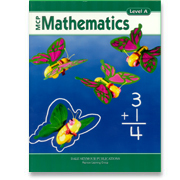 This series from Modern Curriculum Press provides all core mathematics knowledge needed for each grade level and lays a solid foundation for future grades. The Teacher's Guides are highly recommended. Softcover. 2005 Edition: Not Common Core revised!